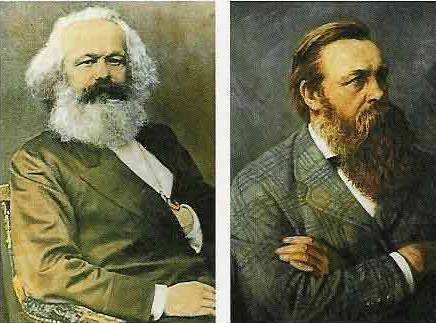 In Defense of Communism: Karl Marx, Friedrich Engels- Manifesto of the Communist Party (1848) Part III "Socialist and Communist Literature"
Karl Marx, Friedrich Engels- Manifesto of the Communist Party (1848) Part III "Socialist and Communist Literature"
III. SOCIALIST AND COMMUNIST LITERATURE. 2. CONSERVATIVE OR BOURGEOIS SOCIALISM. 3. CRITICAL-UTOPIAN SOCIALISM AND COMMUNISM. The significance of Critical-Utopian Socialism and Communism bears an inverse relation to historical development. In proportion as the modern class struggle develops and takes definite shape, this fantastic standing apart from the contest, these fantastic attacks on it, lose all practical value and all theoretical justification. Therefore, although the originators of these systems were, in many respects, revolutionary, their disciples have, in every case, formed mere reactionary sects. They hold fast by the original views of their masters, in opposition to the progressive historical development of the proletariat. They, therefore, endeavour, and that consistently, to deaden the class struggle and to reconcile the class antagonisms. They still dream of experimental realisation of their social Utopias, of founding isolated “phalansteres”, of establishing “Home Colonies”, or setting up a “Little Icaria”# – duodecimo editions of the New Jerusalem – and to realise all these castles in the air, they are compelled to appeal to the feelings and purses of the bourgeois. By degrees, they sink into the category of the reactionary [or] conservative Socialists depicted above, differing from these only by more systematic pedantry, and by their fanatical and superstitious belief in the miraculous effects of their social science.